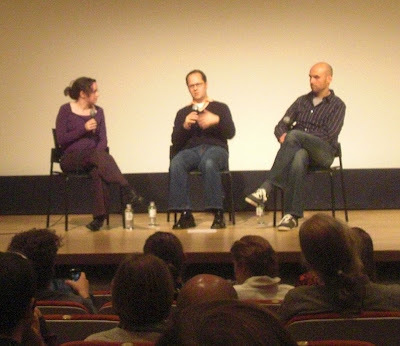 There was a panel discussion afterward, although it was a little truncated because the film started late. The panel featured Madeline Ashby (science fiction writer), George Dvorsky (futurist and ethicist) and Greg Van Alstyne (design educator). Honestly my impression was that only George actually knew anything about the topics being discussed - and he knew everything. Madeline did manage to ask some good questions though. I was also confused about the film, because I was expecting a different film. Turns out, Kurzweil himself is making a film (actually it seems to already have premiered?) called The Singularity is Near: a true story about the future. I knew of this film because Kurzweil talked about it at the 2009 Singularity Summit at length. While on the topic of the Singularity, I also feel a compulsive need to tell you about Harry Potter and the Methods of Rationality, a Harry Potter fanfic written by Eliezer Yudkowsky, the founder of the Singularity Institute for Artificial Intelligence. After Kurzweil, he's probably the best known Singularity proponent (although interestingly enough, he doesn't feature in Transcendent Man). Anyway, the story is excellent, and it starts when Harry's adopted mom marries a scientist instead of the dreadful Vernon Dursley. Harry grows up as a rationalist, and the existence of Magic screams out as a puzzle to be solved in order to Rule The World. Prepare to loose days of your life :-).